A few months ago, I got this overseas call on my cellphone while I was driving. The guy on the other line was looking for a Mr. Rene Enriquez and hearing him say that, I was sure that he's one of my friends abroad playing a trick on me. It took me awhile to realize what he was a recruiter from Ireland and was trying to tell me that his client wants to interview me in 3 weeks time and that I should learn as much as I can about Germany. For sure that conversation was information overload for me while I was driving along Cavite's Aguinaldo Highway because I totally forgot all about it. After a month or so, I got this email from that same guy in Ireland telling me to prepare because his client has already set a phone interview sked with me. This guy was serious after all! And his client too! I later learned that this "big" client was Infineon - one of the top semiconductor companies in the world! Lost no time in researching about the company and Germany. Come interview-time, all the technical details were discussed and tossed around. I know from past phone interviews that this first contact is an employer's way of determining whethere they want to pursue you or not. So, I gave it my best shot - technically. But what broke the ice though was football ! Yes, football - the world's most popular spectator sport in which Germany is one of the mightly nations playing it. It was great to be talking loosely with those top guys about the game. And guess what - five months after that interview, they're now inviting me to visit their company in Dresden, Germany. I don't know if I'm already hired or not but who cares?! If all things work out, I'm definitely going just to have the experience of visiting a football crazy nation. One more football crazy fan/player wouldn't hurt. Hehehe! 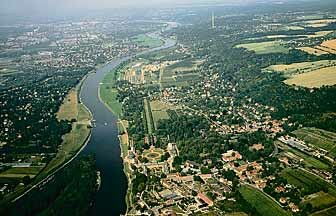 Dresden: The city in the Elbe valley lies nestled in the undulating countryside between vineyards and wooded hills.